Vezeeta is a Cairo-based startup that allows patients to book appointments with doctors through their web-based platform and mobile apps. Founded in 2011 as Dr. Bridge by Amir Barsoum, Vezeeta has come a long way and has now their services available in Egypt & Jordan with Saudi expansion being planned right now. The company currently facilitates more than 100,000 bookings every month through its platform, their founder & CEO Amir Barsoum had told us at RiseUp Summit. Having raised over $10 million in investment, it is the best funded startup from Egypt, backed by regional and global VCs like BECO Capital, Silicon Badia, Technology Development Fund, Endeavor Catalyst, and Vostok New Ventures. Today, we’ll be having a look inside their office in Cairo that hosts more than 150 people across different teams including Finance, People & Culture, Performance Marketing and Operations, R&D, Engineering & Design, Product & Pharma, and Egypt & Gulf country operations. The company has three complete floors in a commercial building in Heliopolis, a quite and posh neighborhood of the city that hosts many local and international companies and is home to some celebrities and politicians as well. Earlier the company used to have only one floor in the same building but because their team has been growing they added two more floors and recently renovated the whole office. We also had the chance to speak to some of Vezeeta’s employees to learn their thoughts about working at the company. When you enter the office, the first thing you’ll see is this little cool waiting area for the guests. There is a waiting area on every floor that the company occupies. The wall with those decoration pieces is almost identical on every floor. The next thing you’ll probably see will be this little room where the candidates coming in for job interviews are asked to fill some forms before taking the interview. And no the plants aren’t live (incase you were wondering that). They’re artificial. It’s not a grand open-floor but there are these tiny open spaces in the office and as (almost) all the employees have their laptops, they can choose to sit wherever they like. Apart from some who have their dedicated offices, the employees can literally just work from anywhere in the office. All the parts of the office are branded with the Vezeeta logo or icon (the V). Another distinct feature that you may have noticed already is how most of the parts of office receive natural right. That’s a great way to keep your employees productive and healthy as found in a study at University of Illinois. We love the roundtables btw. 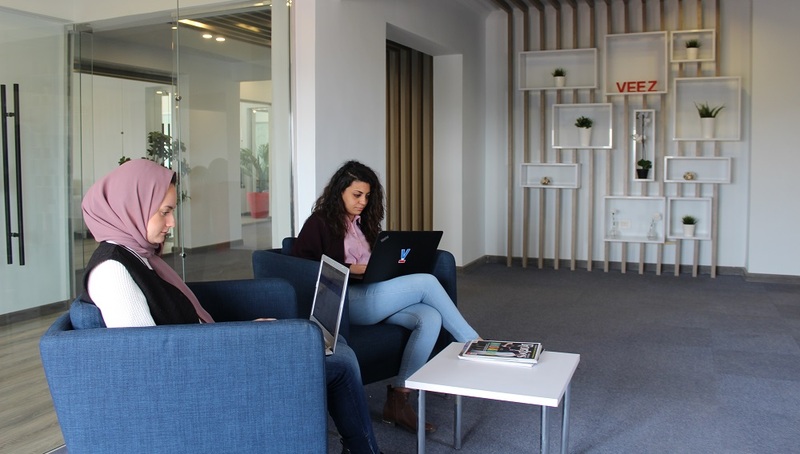 “If you’re looking for a dynamic environment to work at that offers opportunities for its employees to try different functions in different fields, then Vezeeta is your go-to employer,” explained Rabab Sayed, a pharmaceutical graduate who started working with Vezeeta as a Sales Associate and later moved to the People & Culture department, working as Employee Experience Lead of the company. Rabab was also the in-charge of company’s office renovation and she seems to have done a pretty good job with that. Offices of executives in the company are designed in a way that they serve as shared meeting rooms and there’s an open-door policy across the company anyway. All the glass walls (or partitions – whatever you’d like to call them) also serve as dry-erase boards and everyone at the company seems to be making great use of them. And wherever they don’t have the glass-walls, there are the regular dry-erase boards. It seems everyone at the company just loves to brainstorm ideas on these boards. Remember, we talked about natural light? This is the coolest thing about their office. Vezeeta also occupies the roof of the building that serves as recreational and communal space for the employees. Some use it to talk about work. Some to grab a bite. Some to just relax and have a chat with their colleagues. And some to work. We’re guessing she’s on a tight deadline. As the employees working at Vezeeta told us, the office has been carefully designed with well-lit rooms, white walls, dry-erase boards and an amazing recreational space at the roof. The company also offers some cool perks (apart from regular benefits like medical insurance) which includes free drinks at the office, subsidized meals, access to free online courses discounted rides to/from work. You cannot know for sure how a company treats its employees unless you work from them but from the looks of it, Vezeeta seems to have put a lot of efforts to build a great working environment, and that is evident even in their Glassdoor reviews with overall rating of 4.2 out of 5. Startup Offices is a Series in which we cover offices of regional tech startups and try to understand their work culture. We also speak to the employees at these startups to learn their thoughts and feedback about working there. If you would like to have your startup featured, please send us an email at hello [at] menabytes [dot] com or talk to us on Facebeook or Twitter.